Having begun the game in a 4-1-4-1 shape, an injury to left back Behrang Safari encouraged Basel coach Paulo Sousa to revert to the back three that had featured in the opening day thrashing to Real Madrid. However, rather than the 3-5-2 that was utilised a fortnight ago, this was a 3-4-3 (or more specifically a 3-4-2-1), with Mohamed Elneny and Breed Embolo supporting veteran striker Marco Streller. Elneny and Embolo were asked to fulfil their roles in very different ways. Elneny, on the left, was asked to play a lot narrower and deeper than Embolo on the right. This meant that Liverpool right back Javier Manquillo was often left free, as Elneny took up central positions behind the advanced Henderson with a view to providing his side with an out ball on the counter. Embolo, on the other hand, stuck tight to Liverpool’s left-back Jose Enrique at all times. So much so, that Basel sometimes had six players across the defensive line. Unfortunately for Liverpool, Manquillo was poor in possession and was unable to take advantage of the freedom that Basel’s shape was affording him. Liverpool again set out in the 4-2-3-1 shape that they used in the Merseyside derby. Steven Gerrard, persistently exploited as his side’s sole holder over the last 12 months, was again partnered by Jordan Henderson at the base of midfield. Coutinho was brought back into the side to play in the hole behind Balotelli. It was clear from early on that Liverpool were looking to use a low block and play on the break. This approach, combined with aggressive midfield pressing to force turnovers in dangerous areas, was the hallmark of Liverpool’s success last season. However, Basel’s early change of shape foiled Liverpool in that regard. Instead of matching up man-for-man in the middle as they had done for the first ten minutes, Basel’s switch meant that they now had two holders at the base of their midfield, with Fabian Frei dropping back to join Serey Die. Frei and Die were able to play around Phillipe Coutinho in that zone, ensuring possession dominance, and guarding against dangerous turnovers. Indeed, that pair were only dispossessed once in the first half between them, with Die losing the ball to a Markovic challenge near the left touchline. The question is – why did Rodgers wait until the introduction of Lallana in the 70th minute to switch to a 4-1-4-1/4-3-3 and match up man-for-man again? The answer is obvious. This would have left Steven Gerrard as the sole holder, up against both Elneny and Embolo. A recipe for disaster. Rodgers’ decision-making in recent weeks is making it increasingly clear that he’s losing faith in his captain in that position. And why wouldn’t he? Gerrard is joint 35th for midfielders in terms of tackles per game this season and doesn’t even break the top 50 for interceptions. His yellow card challenge on Hamoudi summed up what a poor screener of the defence he represents. Lazar Markovic, Liverpool’s right winger on the night, received a great deal of criticism from various quarters, both during and after the game. While it was largely merited, it was more than a little rich, given the utterly abject performance of Englishman Raheem Sterling on the opposite flank, turning in perhaps his worst display in a red shirt. Sterling was dispossessed four times and lost possession due to a poor touch another four times. He spurned three clear shooting chances in the box through hesitation, was booked for a cynical tactical foul, and should have been at fault for the concession of a penalty kick. There may be an argument that Sterling is at risk of burnout. This was his fifth game in 14 days, a spell in which he has played every available minute, including 120 of them (plus penalties) in the League Cup against Middlesbrough. In the wake of Suarez’s departure and the absence of Daniel Sturridge, Rodger’s ultra-reliance on his young attacking midfielder may be taking its toll. Liverpool needed a lot more from the band of three behind the striker in general. Coutinho, the number ten, was hauled off midway through the second half in favour of Lallana, after another ineffective performance. There might therefore be some slight sympathy for the moody Mario Balotelli, given the level of dysfunction that prevailed behind him. He was not afforded a single touch inside the area throughout the game, a testament to the lack of service. 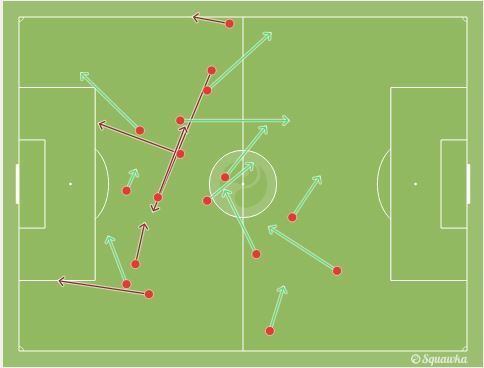 Mario Balotelli’s attempted passes during the game, not one of which occured inside the area. Note that both of his attempted strikes also came from outside the 18-yard box. Another game, another set-piece concession. And another error from Martin Skrtel. Enough said really.